One thing I need to have for fitness success is a schedule! Making it up as I go doesn’t work for me, so I like having structure and a plan. Plans change sometimes and I’m working on a new schedule of practicing live formats to teach, but this had been my plan. Mixing some favorites is a great way to keep things fresh and interesting! 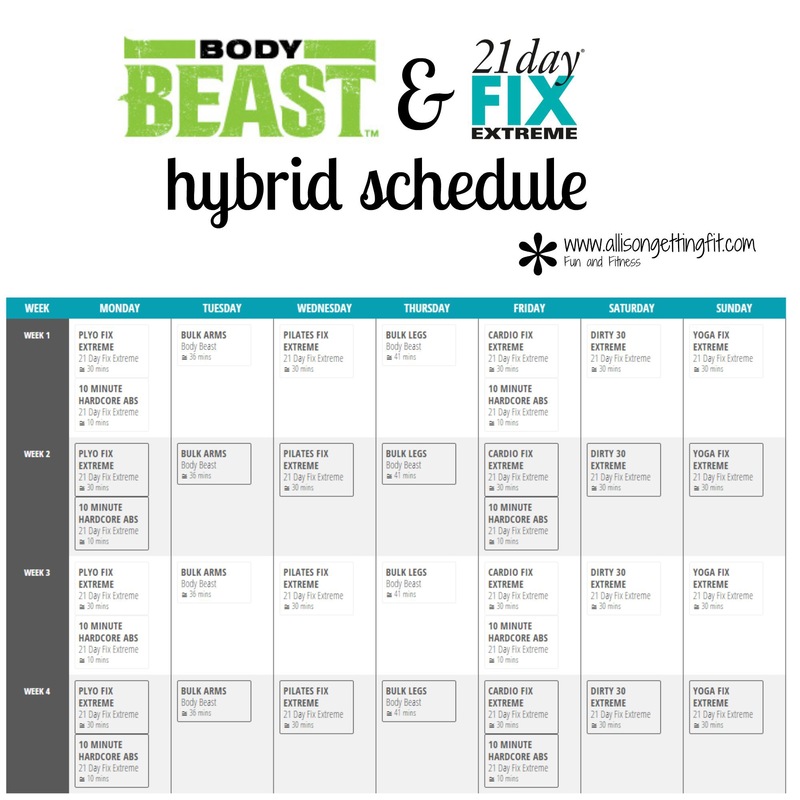 Here’s a simple mix of Body Beast and the 21 Day Fix Extreme. What do you think? If you try this, I want to hear how it goes for you!! Happy Monday folks!! I hope you’re starting off the week feeling motivated and ready to rock! 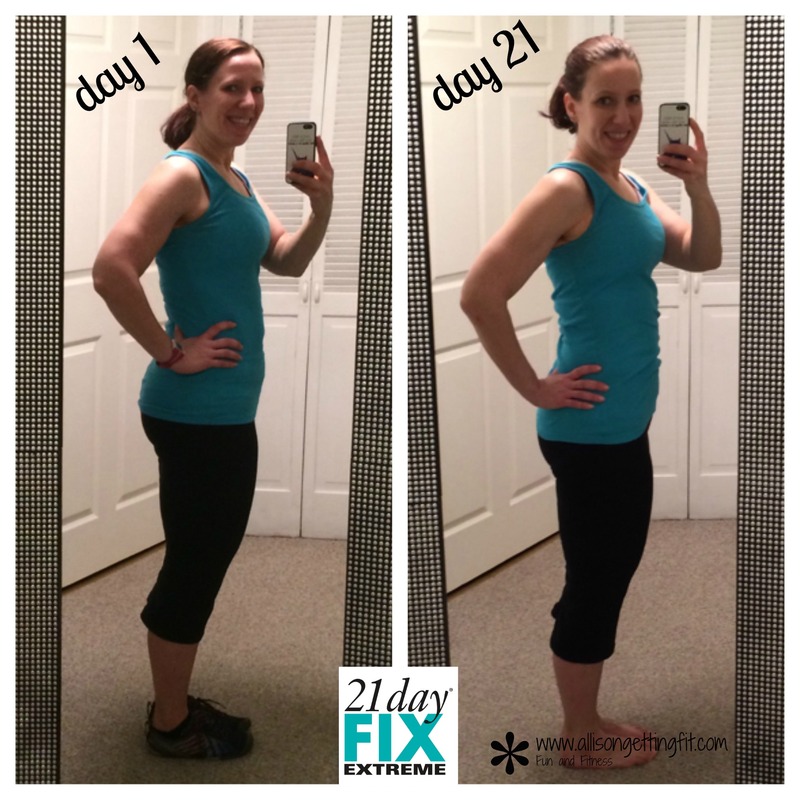 I started my day by changing up from the 21 Day Fix Extreme workouts as I finish out an extended round of the nutrition plan (24 days!). 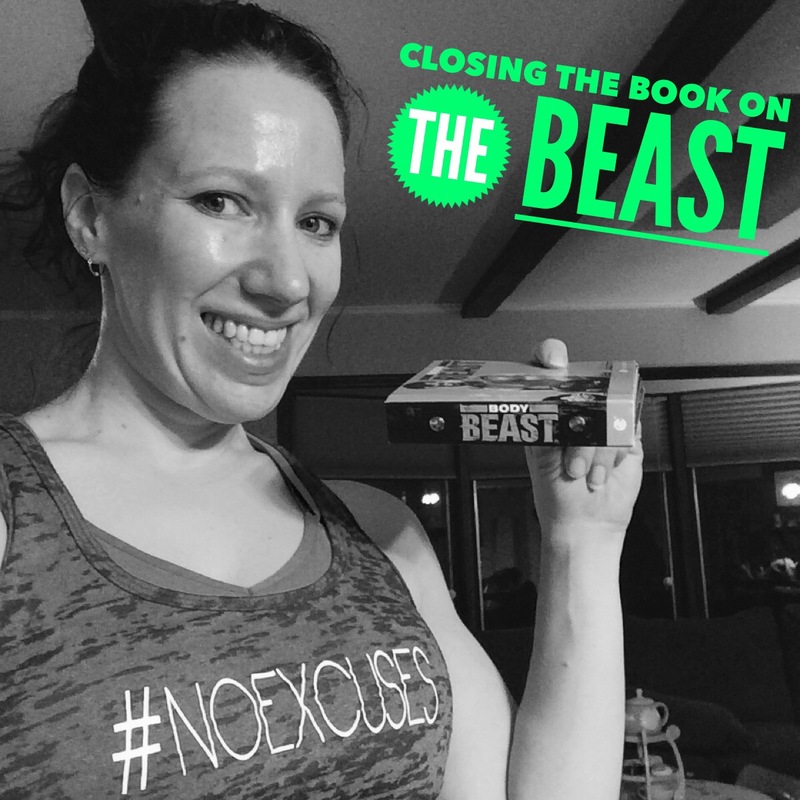 I was working through Body Beast Lucky 7 , the workout that comes as a gift for ordering the Body Beast program through me , and I realized I hadn’t posted about this workout. What is so great about this workout? Try working your whole body in less than 25 minutes! It’s a challenge, but it’s over! The workout goes through 7 exercise pyramids, working each one up to 7 reps. For an example, one is an upright row with a calf raise. So you do an upright row, keep the bar up, raise on your toes. Then you do 2 upright rows, keep the bar up, 2 calf raises. Then 3, etc, up to 7. With no rest in the exercise itself, just between the exercises. Picking a good weight for these is tough, so go a little lighter than you think. You’re basically doing 28 reps in each exercise with no reps! 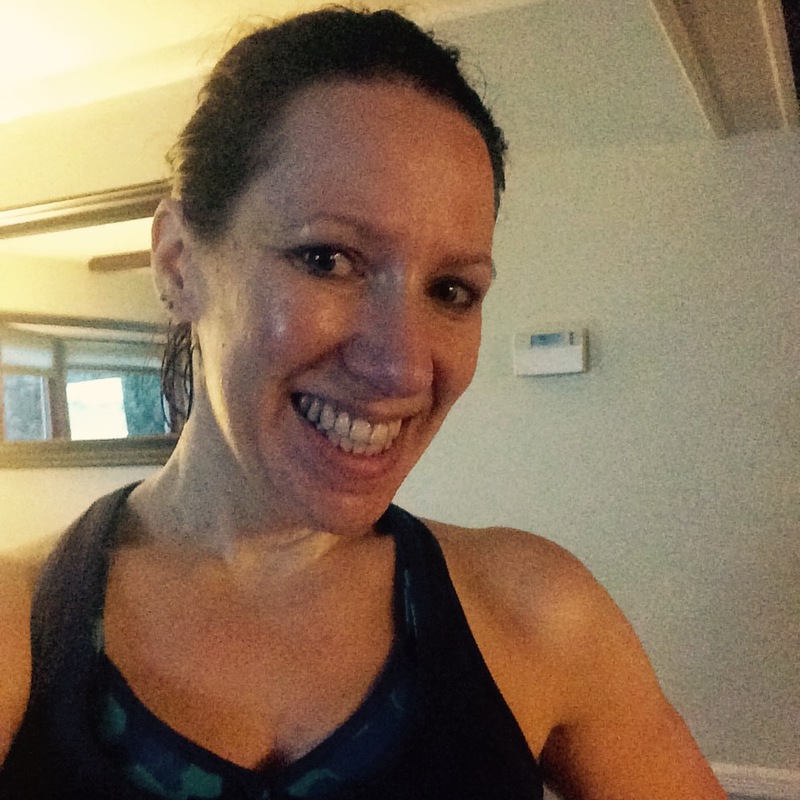 I added on TurboFire HIIT 20 because I still had time after the quickie lifting! That one has 7 (number of the day!) intense bursts of cardio work for under a minute each, then you recover and do another! Here’s a sweaty post workout selfie for you! Super fun morning workout with two of my favorite programs! A great way to begin a Monday. If you haven’t heard, I’m moving from New York to North Carolina in a few weeks! So I’m clearing out my prize stash with an additional gift for any challenge packs (combining a program, 30 days of Shakeology and 30 days of the streaming workout membership!) purchased or if you decide to become a coach and help others in their fitness journey! 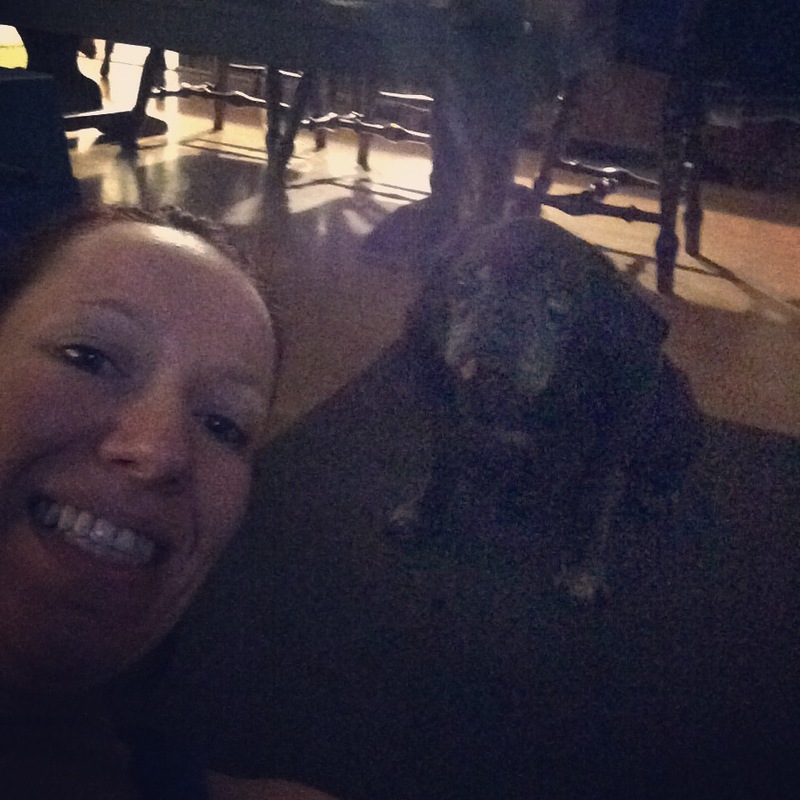 Want to chat about what will be your favorite workout or what being a coach do for your life? Shoot me an email! 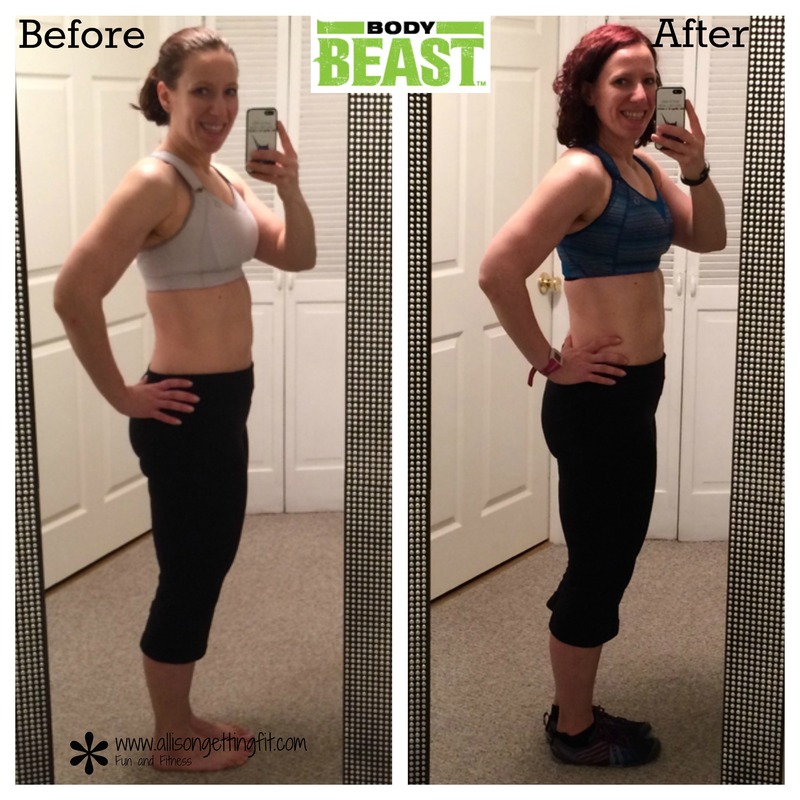 Body Beast Results – Round 2…plus Equipment! So, I finished round 2 (last one finished in November 2014) of Body Beast! Lifting heavy, at home (though you can easily bring it to the gym now with the streaming workouts! ), with fairly minimal equipment. I gained 2 lbs, but it’s definitely muscle. I am fitting in clothes that I’ve never been able to wear. Not before I was pregnant, not when I bought them (most were bought at an outlet when I was feeling close, so they almost fit, but not really wearable comfortably). I only regret not taking flexed before pictures. It doesn’t show as well in the pictures without flexing, but I hope you’ll take my word for it. I feel strong and fit, and like I’m no longer losing baby weight, just going on my usual path to a fitter me. 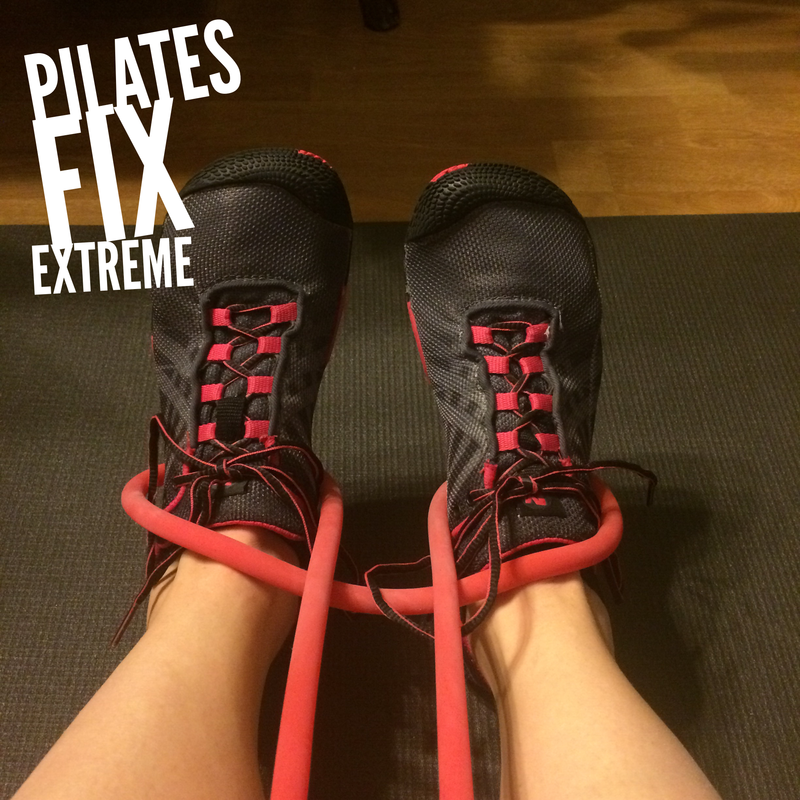 I’m going back to the 21 Day Fix with a twist on a hybrid Fix and Fix Extreme workouts and it’s nice to have short workouts. I love both Body Beast and these quick effective workouts. I know they’re completely different, but I really enjoy both styles and both eating plans! Choosing is so hard. It’s a good problem to have! I expect to do another Body Beast round before this year ends. Now, for the equipment! Everyone asks that…I’m sure because it’s a tough concept. How will you get the resistance at home without having a stocked home gym?? If you have any questions, leave them in the comments! I’d love to hear from you!! So many people as me what I’m eating, so I made a quick video to go through what I ate today! I’m in the Body Beast Beast phase, where you drop your calories and carbs to lean out and show the amazing muscles you created. Here’s what was in my lunch bag for the bulking phase! I’m feeling good and can’t wait to see the final results in less than 2 weeks! I haven’t posted the May deals yet, but you can check them out here. Body Beast is one of them this month! I’m excited to share this program with more people because it is a crazy one…in a different way from other home workouts! Lifting heavy, in your living room. Maybe with your pug! 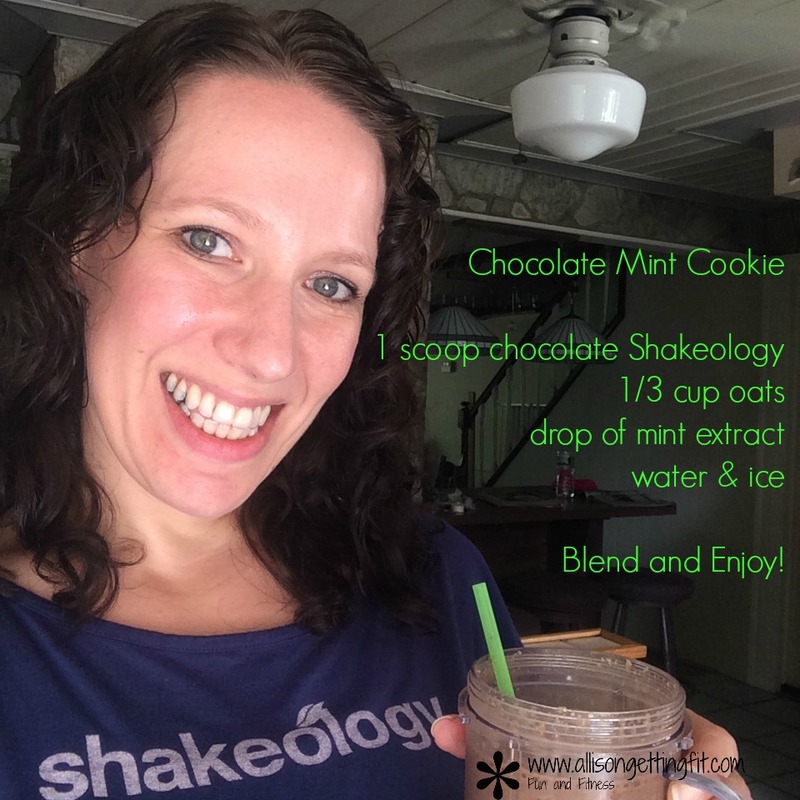 And discounted this month with Shakeology! Artoo and Allison Beast Up! I made this to share in my accountability groups, but you’re going to get it as well! This is a super simple list – I cook nothing fancy! Sometimes fruits and vegetables get switched out (lately, more broccoli!) and fish gets added too (my husband hates when I even cook fish!). But this is a representative base of a typical shopping trip for me. 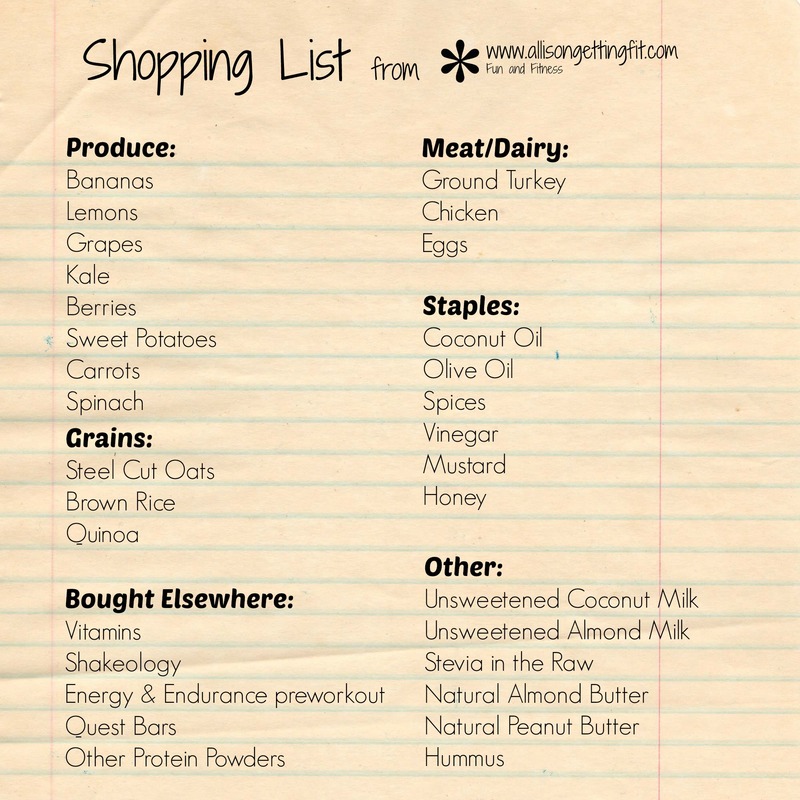 A few things to note…my husband and daughter do eat things on this list, but it is not a list for all of us. This is just me. Also, I am not currently following the 21 Day Fix eating plan while doing Body Beast, but take off the Quest bars and it’s a Fix list. I eat less carbs on the 21 Day Fix, so I probably wouldn’t be buying all of the grains on the 21 Day Fix, unless I wanted a lot of variety. So, what do you think? How does this compare to what’s on your list? 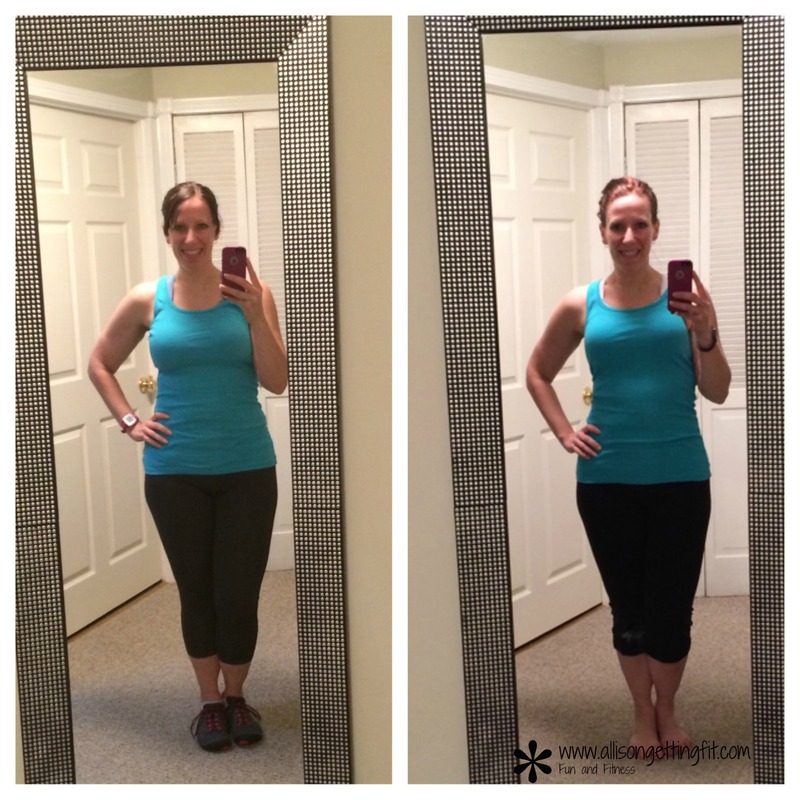 21 Day Fix Results – With Pictures! 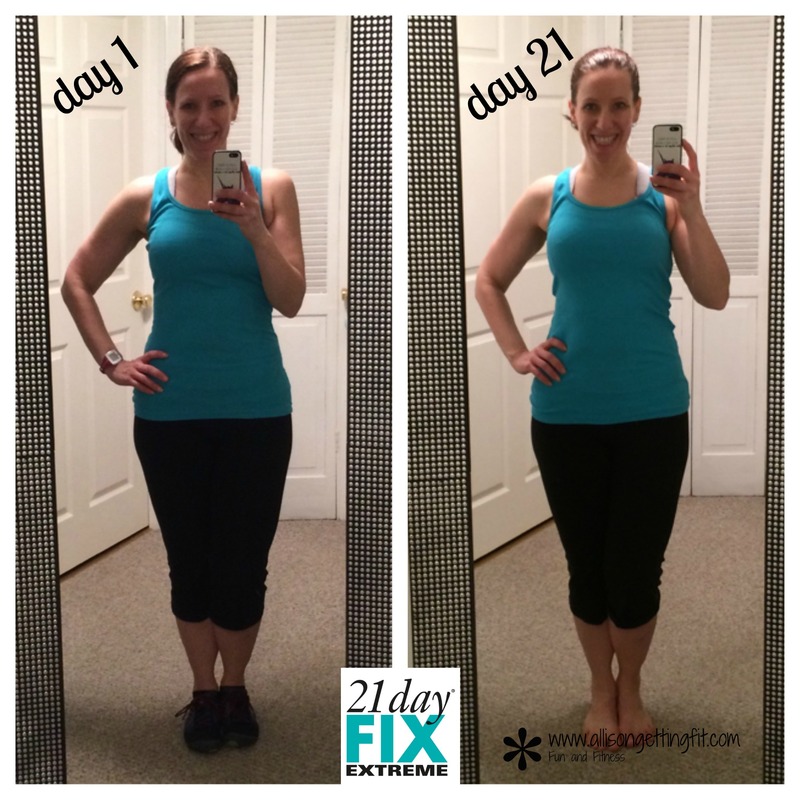 So, yesterday I posted my 21 Day Fix Extreme Results via video. But today, we have pictures! I lost 5.5 lbs and 3.75″ in 3 weeks. My last 5.5 lbs took over 4 months! But above all that is how I feel…fit, healthy, accomplished. I have pulled out clothes that I haven’t got into since 1999 (watch my video from yesterday for that story!) and am making a donation pile of the stuff that’s too big once again…something I just did in December! It’s a great feeling and now I’m set to tackle my next challenge! All that and I was still hungry! I’m still playing around with where I want my food to be for the first two phases of Body Beast where you are eating to build muscle mass. It’s a huge mental shift! But I love lifting heavy weights. I’m sore, feel strong and the hunger means it’s working! How are you challenging yourself today? I have been thinking a bunch about what’s on for Monday, when these 21 days are over. I plan to do Body Beast again, but the Huge Beast program instead of the Lean Beast I did last time. I really enjoyed the heavy lifting, and I want to get back to it. I felt super strong! The difference in the two plans is that the Lean Beast has a metabolic component to also shed fat. Both end with a cutting phase, so it’s really in the earlier phases where you’re building up. I do have fat to lose, but right now, I think I want to focus on building muscle. 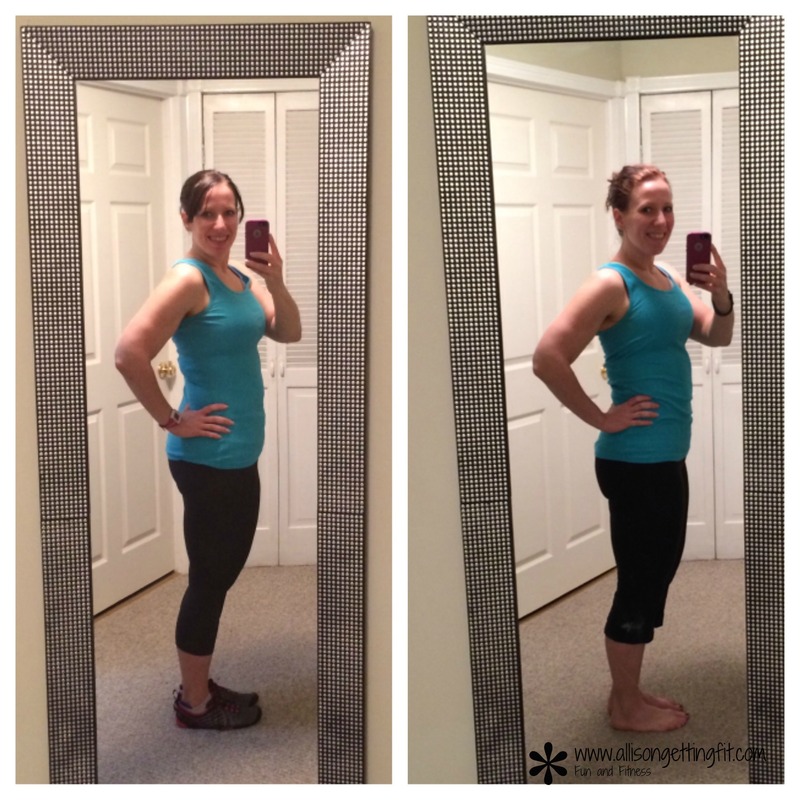 Now, this is a huge mindshift from the 21 Day Fix Extreme, which is focused on getting smaller. I’m having a little trouble getting my mind around the additional calories, but I know that the process is that way for a reason! I still plan to follow the 21 Day Fix eating plan for the most part. Why am I telling you this today? I noticed something this morning. Though I haven’t had chocolate/wine/other treats in now 17 days, I don’t feel like I want to go get crazy Monday. I may have some treats (I got a small box of chocolates for Valentine’s Day and I will have some eventually), but I’m really good with sticking to plan. It hasn’t felt like deprivation at all. That is a big change for me. I usually am thinking of the next big eating day or next cheat meal and what I’ll have! I’m not thinking about that at all. I’m focused on the adding of more fruits, protein and healthy fats more than having chocolate! 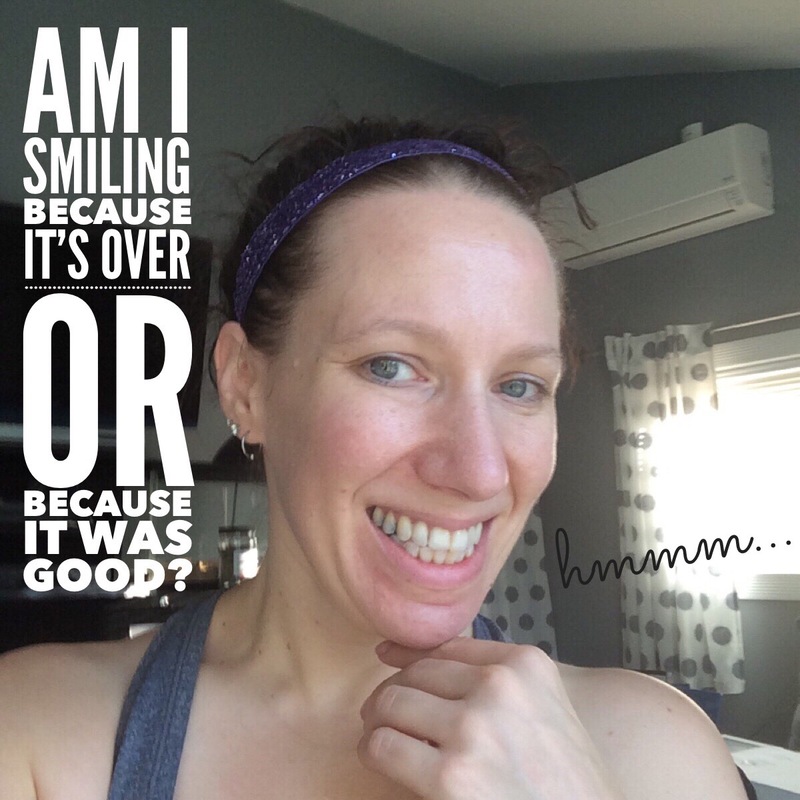 Feeling good is an amazing motivator…along with seeing results! I’m excited to keep up these habits. 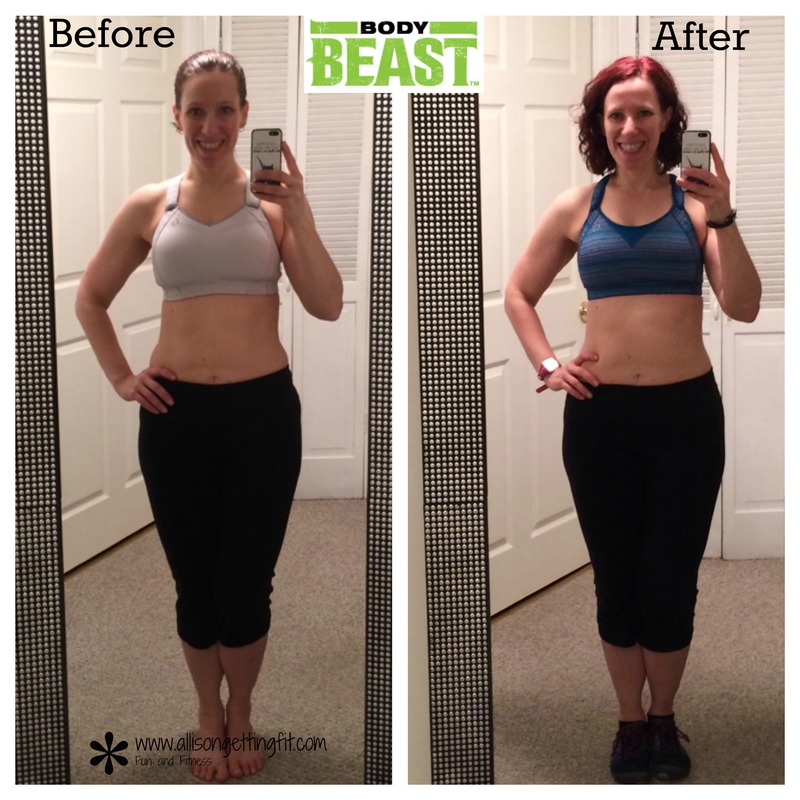 This weekend, I finished up the Body Beast program! How did it go? In 12 weeks, I lost 3.7 lbs and 6.25″. I don’t feel like the pictures do it justice! I’m back in many of my skinnier pre-pregnancy clothes, at a weight that I hadn’t seen in years (and that was after a cleanse) and feel like me. I look in the mirror, and I’m not surprised at what my body looks like. I’m saying “hey, that looks good” instead of “ugh, where did that come from”. At my daughter’s birthday party, I was wearing clothes from the bin I had put away pretty much right when I knew I was pregnant. The skinny clothes bin! I pulled it out hoping for the best with nothing to wear and no time to clothes shop and ended up with an extra laundry load of clothes (now I need to make room in my closet for them!). Beyond that, I feel strong, amazing and ready for more. I love lifting weights and was completely impressed by what I was able to accomplish in my living room. The pre-baby gym rat in me would be truly surprised! Now, the pressure is on to keep up the results during the holidays. I have to admit, I’ve been indulging a little the past 2 days with all these leftover sweets from the party! I need to get them gone (and not by eating them all!). But I have a group that I’m starting a week of focused clean eating with next week that should be a big help on accountability and motivation! Comment or email me and we can get you in too! On that note, I’m sending out an email in a bit to go over some Thanksgiving strategies and recipes. If you’re not on my list and want on, sign up! Also, tomorrow starts the Black Friday deals! Get on the list and you can get in on the event for updates. I haven’t said much about the Body Beast program I started September 1st. It’s a tough program to give continuous results on, which I’ll get into. But I’m going strong (*wink*) and loving the program. I haven’t missed a day yet and am in week 7 of the Lean schedule. The program comes with two different calendars – Huge Beast if you just want to build muscle and Lean Beast if you also want to lose some fat. I am strongly in the still have fat to lose category, so it was an easy decision for me. The biggest difference is in the Bulk block where the Huge Beast calendar doesn’t have Beast Cardio on the schedule at all. Also, the Blocks can be different lengths. So, the blocks. This is why it’s difficult to see results until the end, and why a lot of people give up on the program. Block 1 is Build, where you work on the foundation and working muscles synergistically (together). This phase is 3 weeks long. The workouts are 38-50 min in this phase of the program. The nutrition plan recommends a 25/50/25 ratio (percentage of protein/carbs/fat) for the Build and Bulk phases. You’re taking in a lot of calories, and need fuel in these phases. So there is no focus on calorie restriction here! You’re focusing on muscle growth. Block 2 is Bulk and is all about pumping up your muscles! Same nutrition, and the workouts are 29 – 41 min. You stick with this for 5 weeks in the Lean Beast schedule, 6 on the Huge Beast schedule. It’s where I am now and it’s a good place to be so far. Cardio is once a week, 5 days a week are focused on a body part and one day is rest. Now, the final block is Beast. This is where you’re cutting phase is, where you strip away the fat and reveal the muscle. Here the nutrition drops calories, and goes to 40/30/30 ratios. It’s said to be extreme and you should keep it to 4 weeks max. The Huge Beast schedule has you here for 3 weeks and Lean Beast is 4. You use workouts from the other phases, so not much new there and Cardio shows up more. There is also the Beast – Total Body workout option for Cardio days. I haven’t tried that workout yet but I definitely will be taking that option some days. I adore this program. Though I’m not seeing anything too noticeable, I have noticed some extra definition. I’m really looking forward to the Beast phase so I see what might be hiding under there. I feel amazing and love how strong the program makes me feel. So while I can’t say I’m looking amazing yet, I do think I’ll see good results after the Beast, or cutting, phase! I will say that I don’t love the Beast – Cardio workout. I don’t hate it, but calling it cardio is kind of a misnomer. It does burn calories, but you’re basically lifting light weights with a little plyometric work thrown in. It isn’t so much that I don’t like it, more that I love other forms of cardio. So, comparatively it’s not high on my list. So, how do you judge if you’re making progress in a workout program like this? First off, you’ll feel good. Like whoa. And like you can take on the world. You can’t bottle that! Second, you track your weights so you can look back at what you’ve done. Are you increasing weight somewhere? Does something feel easier? You don’t want to ramp up every exercise in one workout, but there should be a progression in weight or, for the really small muscles where it is tough to increase, ease of lifting. Don’t think you have to stay with little weights! I use from 5-30 so far and will likely be pushing above that. You want to challenge yourself! So, how are you challenging yourself today?